Following a series of issues over the last year with the Core Stage for the first flight of the Space Launch System rocket, the launch dates for both the EM-1 and EM-2 flights are beginning to align, with EM-1 now targeting No Earlier Than 15 December 2019 and EM-2 following on 1 June 2022. Additionally, the EM-3 flight has gained its first notional mission outline, detailing a flight to Near-Rectilinear Halo Orbit to deploy the Hab module for the new Deep Space Gateway. The first flight of any new rocket is bound to encounter design and initial production delays. 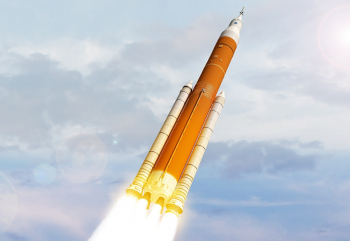 And NASA’s Space Launch System (SLS) rocket is been no stranger to those sort of anticipated effects. 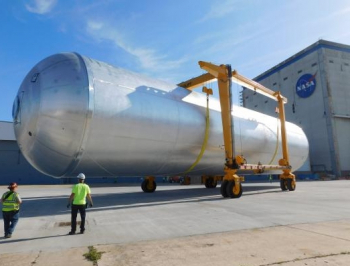 Following a misalignment in the installation of the main welding machine at the Michoud Assembly Facility (MAF), welding for the certification elements for the new SLS core stage Liquid Hydrogen (LH2) and Liquid Oxygen (LOX) tanks picked up. As previously reported by NASASpaceflight.com, after the initial LH2 qualification tanks were welded, a change to the welding machine’s pin was made – a change that resulted in segment welds on the EM-1 LH2 flight tank being too brittle to meet flight specification requirements. This pin change and subsequent issue led to the understanding that the LH2 flight tank for EM-1 was no longer flight worthy and thus could not be used for EM-1. A plan was then put in place to restore the welding machine’s previously used pin – the one that welded all the Core Stage test articles that have thus far passed all qualification and acceptance testing – and use the upcoming weld for the EM-2 flight LH2 tank as the new LH2 tank for the EM-1 flight. However, less than a week after the EM-1 LH2 flight tank issue became known, a worker at MAF damaged the aft dome section of the qualification article for the Core Stage LOX tank. In all, these production issues quickly made the Core Stage’s timeline for EM-1’s then-2018 launch date impossible. Now, it appears that EM-1 will in fact barely – if everything goes to plan at this point – make a Q4 2019 launch. Internal NASA planning documentation acquired by NASASpaceflight.com and available on L2 now shows EM-1 with a No Earlier Than “launch readiness” date of 15 December 2019. This date is directly tied to several major milestones the Core Stage must go through before its delivery to the Kennedy Space Center for final check out, mating to the Solid Rocket Boosters, integration onto the new Mobile Launcher in the VAB, and checkouts at LC-39B. Under the current schedule, the four RS-25 engines that will be integrated into the base of the Core Stage will be delivered to MAF by 15 May 2018. Following RS-25 engine delivery to MAF, teams will spend seven months integrating the engines into the MPS (Main Propulsion System) of the Core Stage before loading the completed stage onto the newly-renovated Pegasus barge for the one-day trip from MAF to the Stennis Space Center. Delivery of the Core Stage for EM-1 to Stennis is currently slated to occur on 20 December 2018. From there, the Core Stage will undergo six months of checkouts, green runs, and hot fire testing on the test stand at Stennis before it is once again loaded onto the Pegasus barge for the week-long trip to the Kennedy Space Center (KSC). Under the current schedule, the Core Stage’s delivery to the Ground Systems Development Office (GSDO) at Kennedy is classified as “To Be Reviewed”, with a notional date for delivery to KSC of 6 June 2019. Once the Core Stage is at KSC, approximately six months is required before launch readiness can be achieved for the EM-1 mission. 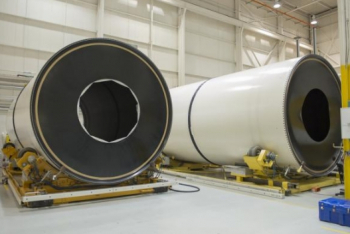 Moreover, the realigned schedule also delays delivery of the Solid Rocket Boosters for EM-1 from their production/storage facility at Orbital ATK’s facility in Promontory, Utah, from October 2017 to October/November 2018. 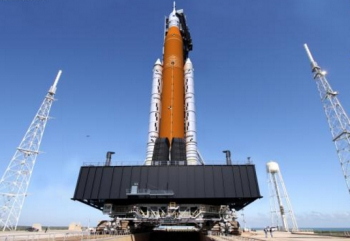 Notably, this is not due to any issue with the SRBs for EM-1 but rather with a desire/ease to leave them in storage where they are in Utah and only transport them to the Kennedy Space Center when they are needed. The new schedule now calls for the Booster’s aft skirts and nozzle exit cones to be on base at Kennedy by 26 October 2018, with all 10 SRB propellant segments at KSC by 9 November 2018 – a near 13 month slip from the previous schedule. 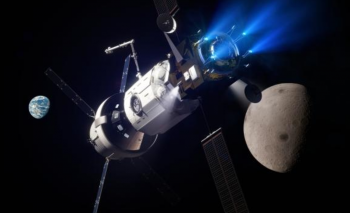 Nonetheless, the updated internal schedule also sheds light on the EM-2 mission – which will be the first crewed flight of the SLS and the Orion spacecraft and is slated to carry the propulsion element for the Deep Space Gateway (DSG). The newly updated schedule now shows EM-2 with a launch readiness date of 1 June 2022, which – assuming a December 2019 launch of EM-1 – would represent only a 2.5 year gap between the two missions. EM-2 will then set the stage for EM-3 – the first NASA in-space construction mission since Endeavour’s STS-134 mission completed United States Operating Segment (USOS) assembly of the International Space Station in May 2011. 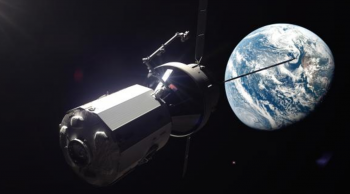 According to the preliminary mission outline, the EM-3 flight would be a crewed mission to Near-Rectilinear Halo Orbit (NRHO) around the Moon. NRHOs are best understood as bridge orbits between the L1 and L2 (Lagrangian 1 and 2) points in the Earth-Moon system that carry highly stable, highly elliptic trajectories with periapsis points close to the surface of the the moon. Placing the DSG in a NRHO will create a DSG orbital trajectory that takes the outpost close to the lunar surface to permit low-energy transfer opportunities for scientific excursions in cislunar space and to the lunar surface itself. For EM-3 specifically, the mission carries a total duration of 16-26 days with baseline objectives to “demonstrate spacecraft systems performance beyond LEO for crewed flight” and to launch the DSG habitat module to NRHO and mate the Hab to the already-launched Power and Propulsion Element (PPE). The PPE will have been launched on the previous SLS mission, EM-2. 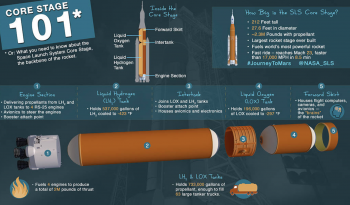 To accomplish these objectives, both the crewed Orion module and the Hab element for the DSG will launch atop an SLS Block 1B rocket as co-manifested payloads from the Kennedy Space Center, Florida. 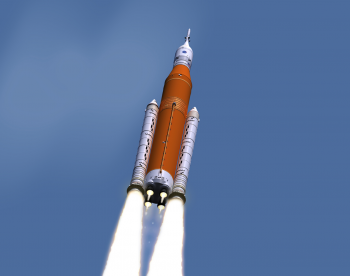 SLS will launch into a 28.5 degree inclination orbit, with SLS’s SRBs and Core Stage inserting Orion and the Hab module into an initial 22 x 970 nautical mile (40.7 x 1,806 km) orbit. Following this initial orbit insertion, which will allow Orion to reenter Earth’s atmosphere safely in the event that the Exploration Upper Stage (EUS) suffers a failure after this point, the nominal mission timeline would call for the EUS to perform an ascent burn to circularize the Orion and Hab module into an 100 nmi (115 miles; 185 km). After post-launch vehicle checkouts are complete, the EUS will fire its engines again for the Trans-Lunar Injection burn, which will send Orion, the EUS, and the Hab module into a transfer orbit to the Moon. Once safely en route to the Moon, Orion will separate from the top of the remaining SLS stack and will likely turn around to mate to the Hab module. The exact details of this are not yet known as the design process for the DSG continues. 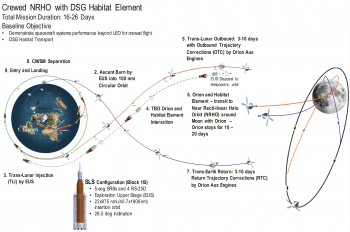 Regardless, over the course of the 3-10 day outward trip from Earth to the Moon, Orion’s auxiliary engines will perform at least four Outbound Trajectory Correction (OTC) maneuvers to refine the craft’s approach to the Moon. These OTCs will allow Orion/Hab to target a precise point to enter a NRHO around the Moon while the EUS performs a disposal into a heliocentric orbit. 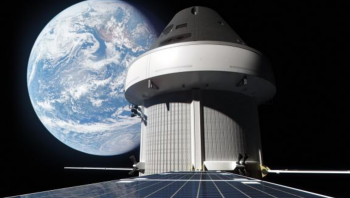 Once Orion and the Hab module have slipped into a NRHO, Orion will maneuver the Hab toward the PPE, and the four-person crew will then connect the two DSG elements together – a moment that will begin in-space construction of the DSG. Assuming EM-3 launches one year after EM-2, the mission would fly in 2023 and would come 24 and a half years after Space Shuttle Endeavour’s STS-88 flight which began NASA’s construction efforts of the International Space Station. Once the Hab module and PPE are successfully mated together, Orion’s crew will perform a series of initial checkout operations over Orion’s 10-20 day stay in NHRO. After this, Orion will undock from the Hab element and baby DSG, and the journey back to Earth will begin. As with the outbound trip, the inbound journey will last between 3-10 days, with Orion’s auxiliary engines performing several Return Trajectory Corrections (RTCs) to properly align the craft for a precise point in Earth’s atmosphere for reentry. According to graphics on the preliminary mission plan, EM-3 will target a splashdown in the Pacific Ocean off the coast of Baja California, Mexico – after which Orion will be loaded onto a recovery ship and brought back to the United States via the Port of San Diego.